Neither rain nor sleet nor snow — nor even the likelihood that he’d be killed en route — could stop this letter carrier from making his appointed rounds. Doug Hughes is one gutsy and creative mailman. In April, this rural letter carrier from Florida stunned the Secret Service, eluded federal aviation authorities, embarrassed Washington’s haughty all-seeing security hierarchy and threw members of Congress into a chaotic panic. 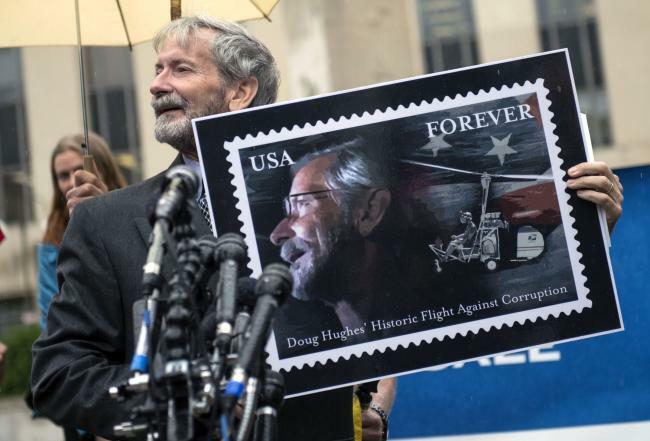 Hughes did all this by boldly flying his tiny, homemade, gyrocopter right through the heart of our nation’s most restricted airspace, then landing it on the front lawn of the U.S. Capitol. 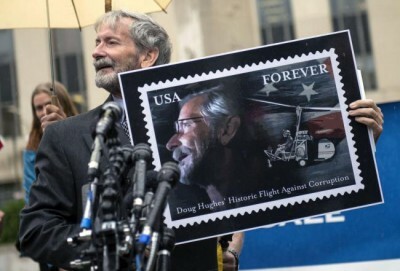 Far from a terrorist or a kook, Hughes was just a mailman on a mission, a patriotic citizen who — like most of us — is disgusted that Big Money interests are able to openly buy lawmakers and laws. But he did more than write a letter to his congress critter — he wrote letters to all 535 of them, loaded the missives in his mailbag and — as postal workers do — literally went the extra mile to make a “very special delivery” in his gyrocopter. This was no flight of fancy. Doug planned his mail delivery for months, and he was fully aware that he might crash, be killed by a scramble of military jets or be gunned down by guards when he landed. Nor was it a sneak attack — he repeatedly posted his intentions in blogs; a reporter was covering his preparations; and the Secret Service had investigated and interviewed him about his plans more than a year earlier. His landing jolted the Capitol into lockdown. Guards rushed out to arrest Doug and haul him off to some deep cellblock; a bomb squad arrived; and spooked lawmakers were scared silly. They ran around screeching that they were threatened by terrorists. Of course, the real threat to America is not some guy flying a gyrocopter in protest but the utter corruption of Congress, the courts and democracy itself by the plutocratic elites whom this mailman targeted with nothing more (nor less) dangerous than a bagful of truth-telling letters. Actually, Hughes was not alone on this heroic mission of civil disobedience — the great majority of Americans are totally on board with him, his message and his bold effort to shake up and shape up Congress. It’s not surprising that when the activist mailman delivered his powerful message to Congress he drew saturation coverage from the mass media. Not coverage of his message, mind you, but a ridiculous spasm of media scaremongering over the non-existent terrorist threat that our self-absorbed members of Congress say his visit posed to them. While Hughes carried no weapons of terrorism on his flight, the message he brought to Washington is politically explosive. So, congressional leaders, who’re always terrified about anything that might ignite public outrage over their pay-to-play corruption, quickly rushed to divert attention from the message — to the messenger. Shazam! In an instant, the politicos fabricated a sob story about themselves, recasting their role from for-sale villains to pitiable victims. We’re threatened by a security network so porous, they squealed, that this dangerous terrorist can easily fly right up to the Capitol building. They convened emergency hearings, went on talk shows and imperiously demanded that they be made safe from such a horrific threat. And the media meekly bought into the whole hubbub, entirely losing sight of the damning message that the mailman was carrying. One time when Thoreau was in jail for his defiance of authority, his friend Ralph Waldo Emerson happened by and asked: “Henry, why are you here?” Thoreau retorted: “Why are you not here?” To help save our democracy from plutocracy, go to www.DemocracyIsForPeople.org.